Sometimes insect names are delightfully whimsical – there is a dragonfly called the Pondhawk, for example, and a butterfly called the Question Mark (which admittedly has a small question-mark-shaped marking on the underside of its wing, but still). As much as I enjoy those, there’s also something very satisfying about common names that are perfectly practical descriptions of the insect in question. What better name for a bug with a colored border around its edges that eats plants than Bordered Plant Bug? I’ve seen a number of these along the boardwalk lately but not until I found one crawling across the floor of my bedroom did I actually pick up my camera and take some photographs. (You know you’re a naturalist when your reaction to finding a colorful insect in your bedroom is to take photographs.) It was clearly a hemipteran, or “true bug,” but to get a specific ID I turned once again to the internet. 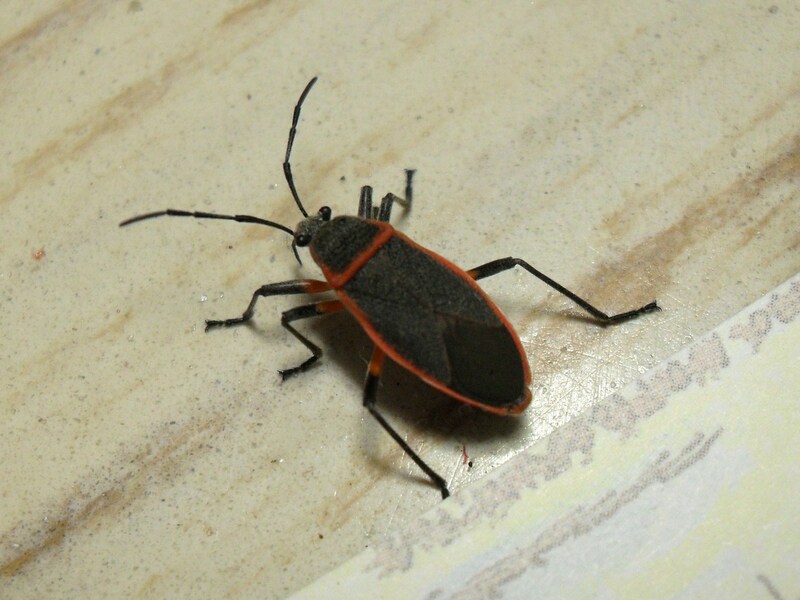 A quick Google image search for “red-bordered hemipteran” quickly led me to the answer: it’s a member of the genus Largus, the Bordered Plant Bugs. According to their BugGuide page, these members of family Largidae feed on the juices of many plants, but among their favorites is wax myrtle, a shrub commonly found on the sand dunes here on Jekyll Island. Suddenly their presence along the boardwalk to the beach makes sense! I love it when I go looking for an identification and end up going a step further and piecing together the ecology of what I’m seeing. Looks a lot like the Box Elder Bugs that try to invade my house at this time every year. True, but I believe those actually have red/orange markings going across their backs, not just a border. Next Next post: A Poem as Lovely as a Tree?